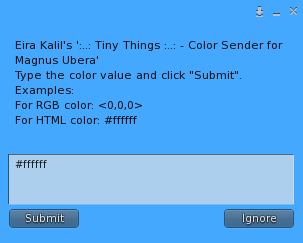 I got some request about send a specific color to the Magnus Ubera's skin, with this small HUD, you can send color in RGB or HTML (Hex) format. It will help to match the breasts with the skin but only will be helpful if you know what are RGB and Hex colors :). The use is pretty easy, click on the HUD, a text box menu will pop up, type the color value in RGB or Hex format and click Submit. The HUD is available at the in-world store or at marketplace for 0 L$.